Freight shipping is a massive and rapidly expanding global industry, accounting for roughly 8 to 10 percent of the Gross Domestic Product (GDP) worldwide.1 Cost-management efforts, tightly held within service-level agreement constraints, have been a decades-long value driver. The result is a highly fragmented and intermediated ecosystem of specialized businesses that conduct their operations based... on centralized data systems. A fundamental challenge for the logistics industry is the inevitable discrepancy between these centralized information system records and field realities. Anytime a human in the field scans a package while loading or unloading a shipment and, for whatever reason, fails to follow what the centralized system expects them to do (e.g., person gets distracted and fails to load a package or puts the package on the wrong truck), the result is a discrepancy between what the centralized information system “believes” is true and real in the field. Traditional “track and trace” solutions have focused on doing the same thing better— attempting to improve the quality and reliability of centralized information system updates in real time. 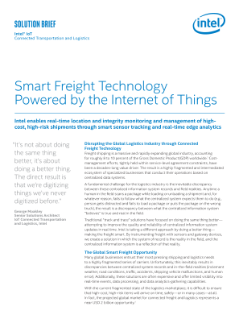 Intel is taking a different approach by doing a better thing— making the freight smart. By instrumenting freight with sensors and gateway devices, we create a solution in which the system of record is the reality in the field, and the centralized information system is a reflection of that reality.